The theme for Friday is Forgotten Books, the weekly meme hosted by Patti Abbott at her blog, Pattinase. So don't forget to check in at Patti's to see what Forgotten (or Overlooked) Books other bloggers are talking about today. My entry is SINGING IN THE SHROUDS by Ngaio Marsh, one of her many enjoyable Inspector Roderick Allyn mysteries and one of my faves simply because it takes place on board an ocean liner. Mystery aboard a boat. What could be better? Well, mystery on a train, maybe. Or mystery in the library - but I think you know what I mean. Author of 32 mystery novels and considered a Grande Dame alongside her contemporary, Agatha Christie, Ngaio Marsh was born in New Zealand and made her mark in the theater as a long-time producer/director, before turning to writing mysteries. I've read every Allyn mystery (mostly in one grand extravaganza a couple of years ago) and recommend most of them very highly. If you'll check out my 101 Favorite Mysteries list (link on my left side bar) you'll find some of the Marsh titles I especially loved. 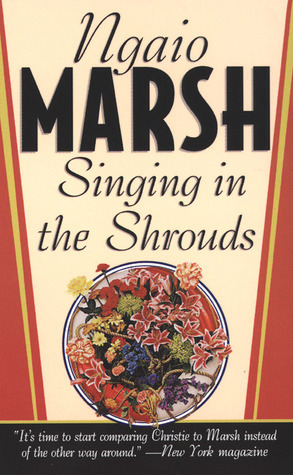 SINGING IN THE SHROUDS is not the best written of Marsh's books, but that doesn't stop it being one of the most eerie and fun to read on a foggy night when you're in the mood. The search is on for a serial killer on the high seas. (Yes, even Ngaio Marsh wrote a book about a serial killer way back then.) To add to the macabre quality of his foul deeds, this fellow likes to sprinkle flowers and sing a little ditty over his victims. Being a British mystery, of course everyone on board is an eccentric type of one variety or another - that's to be expected, in fact, that's what I love about these sorts of stories. I mean, it wouldn't be any fun if everyone involved were just boring and pedantic and normal. No blood-letting or long-winded entries into the killer's thoughts to worry about here. This is, more or less, a cozy set on the high seas as Inspector Allyn must use every ounce of intelligence and detective expertise to catch a killer bound any moment to kill again. I just finished reading a maritime whodunit as well - must be a bit of Summer fever! I haven't read this particular one and in fact am not always a Marsh fan, usually preferring the setup to the payoff really. But am always intrigued by earlier books about serial killers before it became such a storytelling cliche - thanks Yvette, shall put it on the list as it's been too long since I ready anything by Dame Ngaio. I think I am one of Marsh's biggest fans, Sergio, so I'm prejudiced. I love her stuff. As I mentioned in the post, this is not great Marsh, but it's a lot of fun. I have all of Marsh's books on my Nook - bought after you told me how great they were. I've only read 2. I keep thinking my life will slow down enough for me to properly enjoy them and it just hasn't yet. Okay and that makes me really sad to say that. So that is why I'm so glad when you feature the best of the best on your blog. Someday I'll be able to read these, right? I just did my friday post on Murder by Latitude, another shipboard mystery. Serendipity! Did you read DIED IN THE WOOL yet? That's one of my faves. For a cozy writer - more or less - Marsh could come up with some grisly murders. Not to worry, eventually you'll be able to squeeze them in. I worry too about all the books accumulating hereabouts. Nothing to do but grin and bear it and hope that time doesn't run out. HA! Coincidently, I just finished Mignon Eberhart's Five Passengers from Lisbon about a small group of survivors of a shipwreck who are rescued by an American hospital ship in the days just following the end of WWII in Europe. One of the rescued party is a killer and the small group grows smaller as the killer seems determined to kill all those rescued. Although completely different in tone and plot, it reminded me somewhat of Christie's Cards on the Table in that it involved murder among a very small group of potential suspects. Plus Eberhart's book included a nice romantic sub-plot too. But this one sounds terrific. I think I'll see if I can find a copy. Thanks for the tip. Yvette, I last read (and enjoyed) Singing in the Shrouds some years ago - time to re-read, I think. As Sergio says, it's intriguing to see how classic authors handled serial killers; I remember this one as being quite well done. Back into the TBR pile again! I'm also reminded that Marsh did a similar thing in A CLUTCH OF CONSTABLES though then the 'ship' was some sort of river barge in which Alleyn's wife Troy is taking a cruise. Your comment will appear after I take a look. Happy days are here again......! I'm here but not really here! What Makes Great Art Great? My Stylish French Box...the winner!